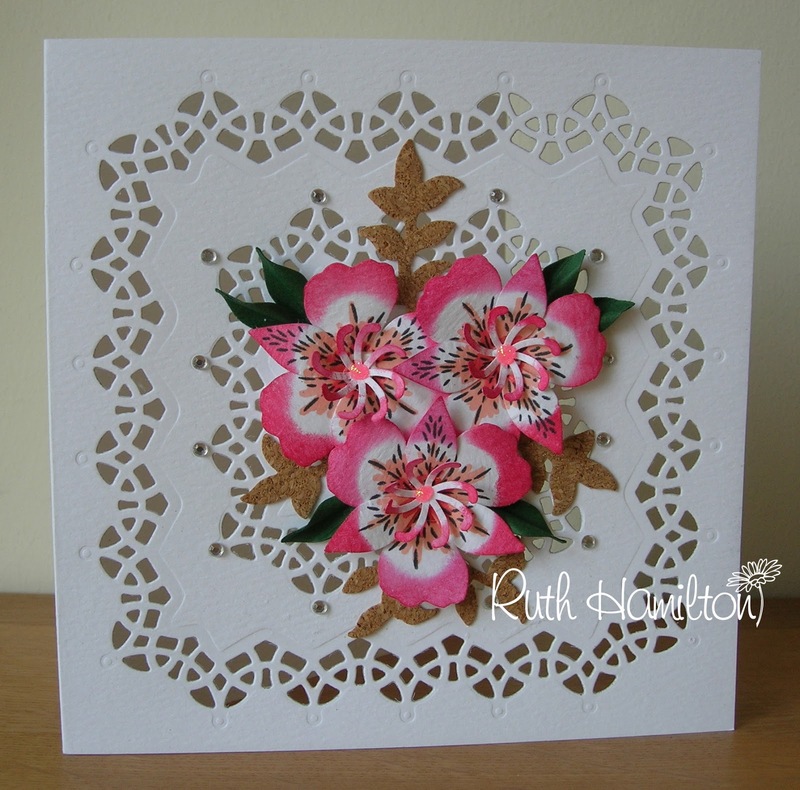 I've made a card using the Gothic Border square die set from Tonic Studios with the Peruvian Lily, Evening Primrose, Corncockle Punch and Stamp set.. the instructions are below. Where do you get your inspiration for crafty projects from? I was wearing this dress and sandals a couple of days ago and finally realised that crafting had got a hold when I kept looking at it and thinking ....mmm, lovely colours for a card....I could use my self adhesive cork....and gems... Oh dear. It might just be the heat!!.. 1. Place the patterned Verso die centrally on the front of the card ...on top of the Multi purpose platform and one cutting plate. 2. Place the other cutting plate on top of the die making sure that the edge of the plate is level with the fold of the card - NB..this is VERY important, otherwise you will have a deep crease line on the card. 3. You may need to use a shim (extra layer of card). Place this directly on top of the top cutting plate. Pass through the Big Shot once or twice. 4. The result is a pattern cut into the card front. I have placed it on top of a piece of black card so you can see the finished effect. 6. You can then do the same with the smaller die to create a pattern in the centre. Remember to place the top cutting plate just up to the fold :).